Anna Bolton | Greene County News Greene County Animal Care and Control Director Julie Holmes-Taylor pets Franklin, a 9-year-old domestic short-haired cat who is up for adoption. 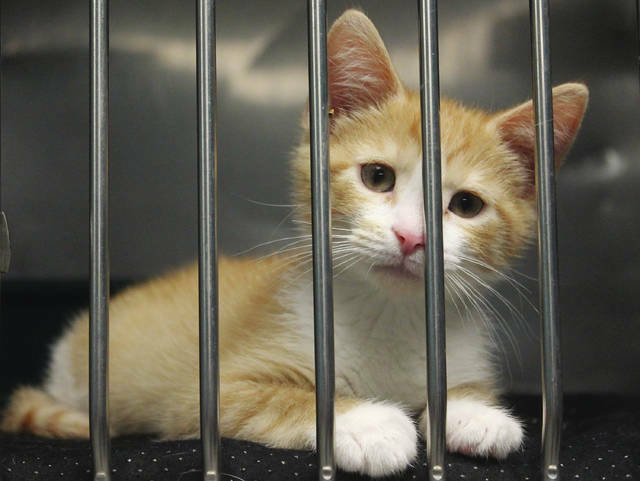 GCAC staff work every day to care for shelter dogs, cats and kittens like this one and ultimately place them in new homes. 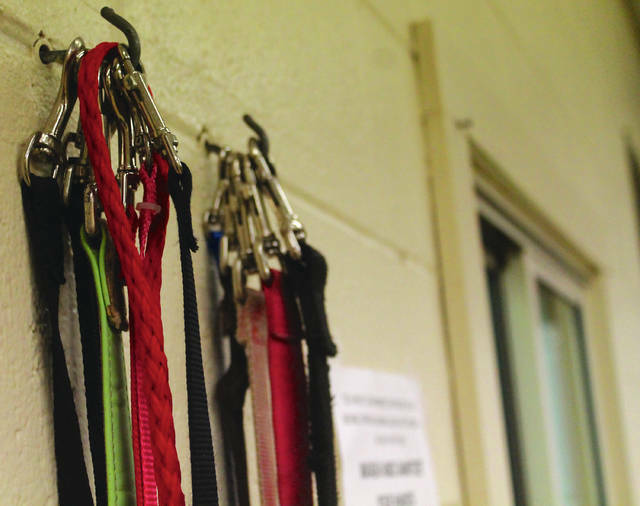 Leashes hang outside the dog area. Julie Holmes-Taylor shakes the paw of one friendly dog as she walks through the kennel area. Donate cat and dog food, kitty litter, cleaning supplies, office supplies and household decorations. Shop online through Amazon Smiles for GCAC. Share Greene County Animal Care and Control posts on Facebook. Adopt a cat or dog. XENIA — Julie Holmes-Taylor walks into the cat room and a gray and white feline slinks across the floor to her feet. “Franklin greets me every morning — I don’t know what I’m going to do when he’s not here,” Holmes-Taylor, director of Greene County Animal Care and Control, said, as she reaches down to pet the cat. Franklin’s home right now is the cat room at the shelter on Dayton-Xenia Road. The room is complete with a sunny day mural on the wall, colorful bean bags on the floor, climbing trees around the room and a diffuser that constantly dispenses cat pheromones into the air. 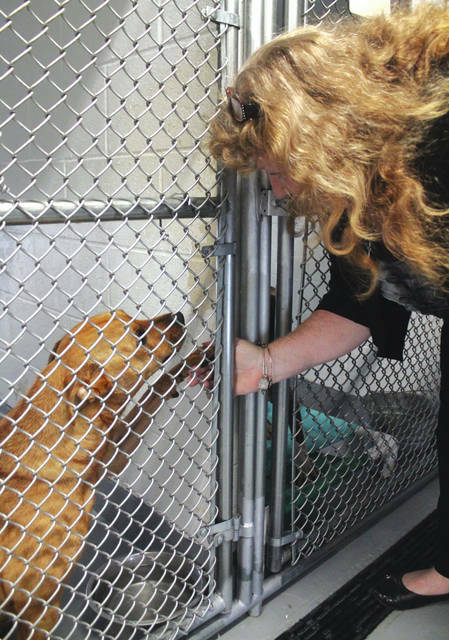 Holmes-Taylor said the diffusers — which are also used in the kennels for dogs — keep the animals calm and less stressed. “If their immune systems are up then they are less susceptible to diseases,” she said. Beyond the cat room, the department has a food pantry where people can pick up supplies once a month, a training room for volunteers and groups, meet and greet areas for adoptions, dog kennels and outdoor areas. At the top of the director’s wish list is an additional wing in the facility, which would provide more kennel space for the animals. One important concept, she said, is to keep the stray animals separate — even in passing — from the adoptable animals that have already been vet-checked and vaccinated. Besides the diffusers, the dogs also listen to music during the day to calm them. 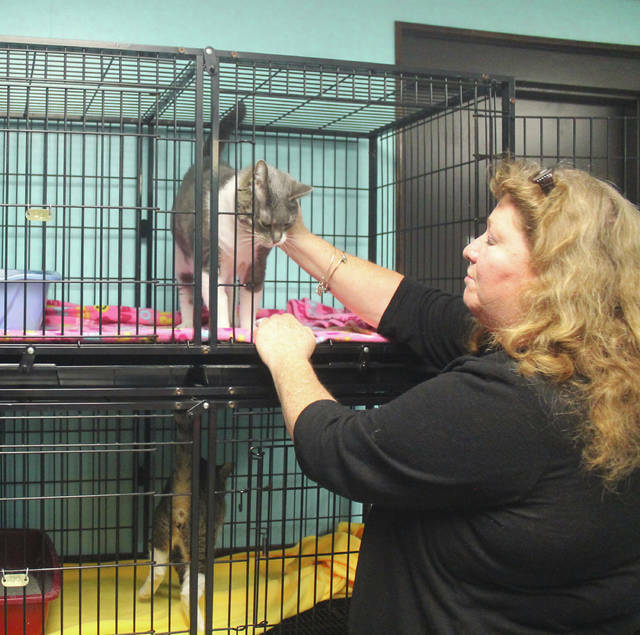 “Everything we do here — we find ways to reduce stress for the animals and provide kennel enrichment,” she said. The facility also has an isolation area for feral animals, an area exclusively for sick animals and new moms, and a surgery room. Before animals are put up for adoption, they are vet-checked, tested for heart-worms, given their first shots, spayed or neutered and micro-chipped. “We try to make sure, truly to the best of our ability, the animal doesn’t have diseases before we place them in a home,” Holmes-Taylor said. The director said she’s looking for vets that would love to come into the shelter and donate their time. They would then get referrals for cats and dogs that are adopted out. The adoption fee for dogs is $135, which includes a dog license, and $90 for cats. Nine-year-old Franklin, although seemingly adapted to this comfortable environment, is still looking for a permanent home. Holmes-Taylor has been director at GCAC since November 2017. For 20 years she worked as the dog warden and humane officer for Butler County, then she moved to Georgia to work at an agency there for two years. When the position at GCAC opened up, she visited the shelter. Since she’s been in Greene County, she’s rebooted the agency’s social media sites, hired a veterinary technician on staff, changed some design aspects of the shelter and revamped the volunteer program. “We have a staff of 11 people — that includes weekends and we run a 7-day-a-week operation. We work part of a second shift and run an on-call, too. And we handle 1,400-1,500 animals a year, which doesn’t include wildlife calls or mutual aid or assists. We’re a smaller shelter but it’s a big operation, so we rely heavily on volunteers,” Holmes-Taylor said. Volunteers — which are always needed — walk dogs, play in the cat room, fold laundry, clean cages, work events, take photos or videos of animals, share social media posts and donate supplies. The director has more plans on the horizon — like expanding the spay/neuter program and increasing humane education at schools and community events. More dogs and cats like Franklin are waiting to be adopted at 641 Dayton-Xenia Road. https://www.xeniagazette.com/wp-content/uploads/sites/32/2018/06/web1_Franklin.jpgAnna Bolton | Greene County News Greene County Animal Care and Control Director Julie Holmes-Taylor pets Franklin, a 9-year-old domestic short-haired cat who is up for adoption. https://www.xeniagazette.com/wp-content/uploads/sites/32/2018/06/web1_Kitty.jpgGCAC staff work every day to care for shelter dogs, cats and kittens like this one and ultimately place them in new homes. https://www.xeniagazette.com/wp-content/uploads/sites/32/2018/06/web1_DogLeashes.jpgLeashes hang outside the dog area. https://www.xeniagazette.com/wp-content/uploads/sites/32/2018/06/web1_DogKennel.jpgJulie Holmes-Taylor shakes the paw of one friendly dog as she walks through the kennel area.